Navimie over at The Daily Frostwolf has tagged me for Gnomeageddon's Meme the Sixth challenge. This caused an odd mix of "yay!" and "oh god subfolders I don't have those it's all one giant folder of images ordered only by date". Let's not panic though! I just cheated instead. - Open the sixth sub-folder and choose the sixth image. - Publish the image! (and a few words wouldn’t hurt, though I dare say I couldn’t stop a blogger from adding a few words of their own). - Challenge six new bloggers. I figured instead that I would pick the sixth row of thumbnails, sixth along and show you that instead! 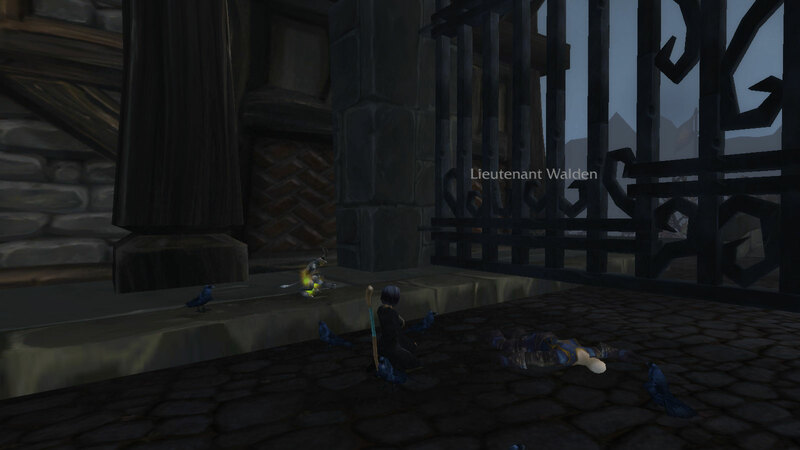 This is my fledgling warlock, Nefarna, as she finds Lieutenant Walden dead at the start of the Gilneas starting zone. I loved the crows, the bleak surroundings and the general feeling of doom - everything that could go right seems to go wrong and this is just the beginning. It's going to be hard to find 6 more bloggers to tag, but here's my best attempt! I totally need to go home so I can make my Sixth post! Hehe! "Two down, five across" "Damn, you hit my picture of a dancing naked draenei on a mailbox. I liked that one!" Phew! I'm glad you participated and didn't get mad at me Ara!